Refurbished sleeve. A used roller with a new outer sleeve, #SA005.R. New sleeve. This is a new roller core and sleeve. #SA005.N. and snap ring. The roller comes fully assembled for immediate installation. #SA006.N. bearings, and snap ring. Fully assembled for immediate installation. #SA006.R. 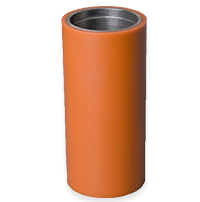 A core credit is available for your used roller sleeves; credit of $25 is given upon receipt of each used roller with the steel core in usable condition. Remove the old snap ring, center shaft, and bearings before shipping your sleeves. I can also rebuild your rollers for you, replacing parts as necessary and returning the complete assembly to you in like-new condition. 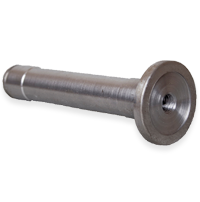 The price for this service varies with the condition of the individual roller components. Contact Me to make arrangements for us to refurbish your old rollers. The bronze bushings fit inside the slot on the front and rear side aligner plates, and act as the guide for the arms. 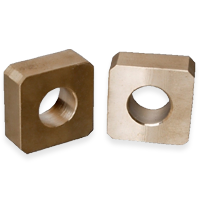 These are wear items and will need to be replaced periodically; worn guide bushings will decrease the effectiveness of the side aligner. There are two bushings for each roller, and most machines have 4 bushings total. New material, same price!